While the Chinese are busy scouting the best under-sea sites to pillage for precious metals, America's venerable oceanic exploration sub, the newly-renovated DSV Alvin, continues to uncover scores of deep sea life forms that science has never even seen. Here are just a few of the more exotic animals Alvin has come across in its travels. These bioluminescent ctenophores are found throughout the world's oceans and are especially abundant around the Mid-Atlantic Ridge. They're named after Alvin pilot Dudley Foster, who collected the first specimens. These bristly deep-sea polychaetes, better known as the Pompeii Worm, are some of the hardiest organisms on the planet. In fact, they're able to tolerate temperatures that would scald any other animal—routinely bathing in waters up to 130 degrees F around the deep sea vents on which they live. Sometimes you have to search out your scientific discoveries, and sometimes they go ahead and reveal themselves by attacking the Alvin's manipulator arm as this octopus did at a depth of 7,500 feet. It turned out to be an entirely new species. The brown mussels and red tube worms seen here were some of Alvin's first discoveries when researcher began exploring the ecologies of deep sea vents. Rather than go through the trouble of evolving mouths or digestive systems, these worms simply bathe themselves in the superheated, toxic metal-laden waters and rely on colonies of symbiotic bacteria to produce the energy both organisms need to survive. These shrimp don't need eyes where they live—there's not light down there anyway—so they went ahead and got rid of theirs. Instead, researchers posit that the splotch of red pigment on their backs may somehow detect the radiation generated from the deep sea Mid-Atlantic vents upon which they live and keep them from straying too close to the boiling waters. 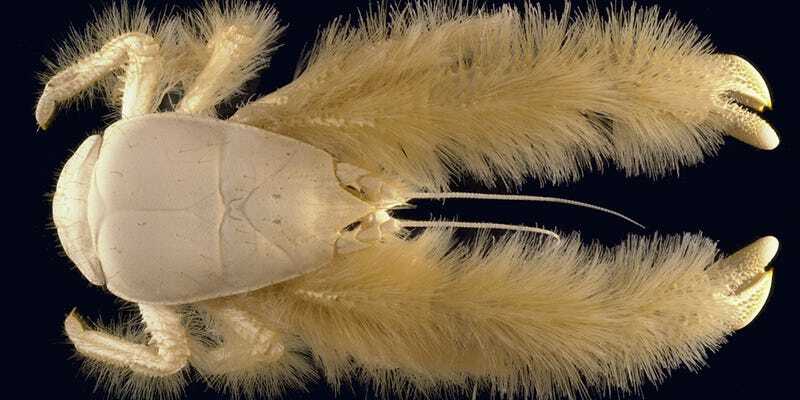 Better known as the Yeti Crab, these are just one of a myriad of crab species thriving on detritus and live prey around hydrothermal vents.